This project has been the most difficult for me this semester. The first challenge was simple: what to make a website about? 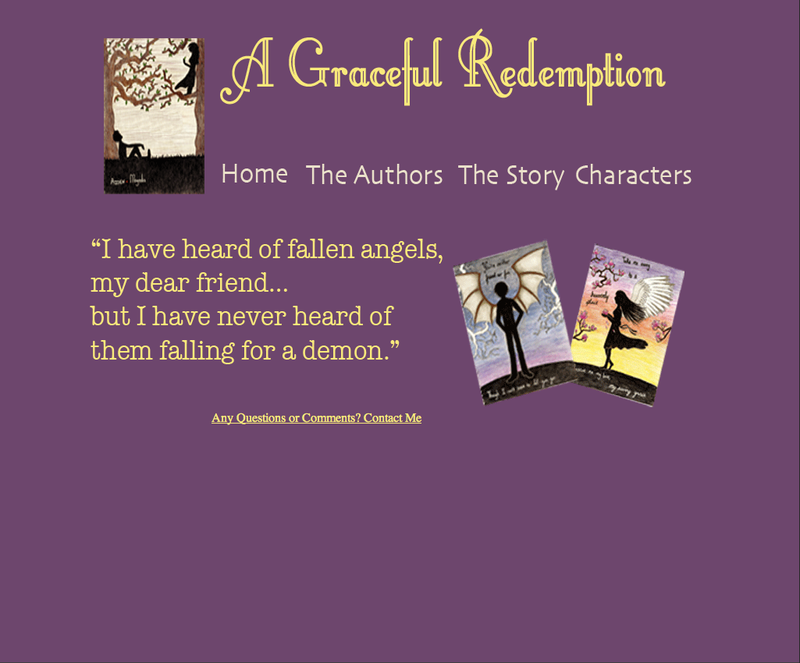 A Graceful Redemption is the book my friend, Joslyn Murgo, and I have recently written. We are in the process of editing it and because it was on my mind I decided to make a website for it. The next challenge was designing the site on photoshop because I’ve always had difficulties designing things quickly. I went through two or three different layouts before deciding to use this one. Then there was DreamWeaver. At first it was one of the most brutal programs I’ve worked with, because I had no idea what I was doing. It took a few days, but as soon as I got the hang of DreamWeaver recreating the website design from photoshop in dreamweaver was simple. A week later I have my finished project and I’m proud of it. It’s definitely something that took a lot of time and effort because I had hardly any experience in the programs I used. Although, after this project I want to go and make another website for the second book we are writing – just because I can. In the future I want to keep this site updated because hopefully our book will get published. This website will be used to keep people updated on how the book is going (if it will get published) and things like that. I’m excited to see how this website will turn out in the future. « Live Life the All Star way…. Good job, this looks like a cohesive site. Watch out for your menu that it doesn’t move. Also good use of fonts and colors. I really like the colors and the drawings on your website! I can’t wait to see what you put under authors! Great Job and great content! I really liked your website, especially the color scheme and font choices you used. I thought that they complemented your product nicely. The only thing I would work on is making it a little more clear about what the website is about and who made it. It’s not immediately clear that it’s a book. I thought the fonts you used worked really well with your subject. However, I’m unsure what your subject is because I see some quotes and drawings but don’t know what they are. Your link for the authors wasn’t working, so maybe an explanation was in there. wow this turned out great! I really love your colors and the whole feeling your colors/font/everything gives off. I like that you decided to do something different and do this story. I also like the quote it definitely draws people in. Good job! The simplicity of your site was very good and i think it worked well for what you were trying to promote. Also it would have been nice to see a little bit about what your site was about on the first page but good job! I think your website is really well done and the color scheme seemed to go really well with everything, I just wish I could know more about the book. Also your authors link was not working and this could have had more information about the book. I like that you give us a sample of the writing as soon as we enter your website. After that, anyone should feel the need to dig a little deeper into the site. That was a smart move. This seems like a really cool project and the website fits it well. The colors go really well together as well. I think the navigation from the front page is a little confusing however and it would be cool if there was some indication that the words were actually buttons. After viewing your website, I so want to read your book! I love the backstory to your website – it was a smart decision to make this site to advertise the book you and your friend are writing about. I just wish there was more content so I could learn more. I like the subject of your site it was fun to learn more about your site and I like the font you used a lot. I think that it is so cool that you and your friend are writing a book. I love that you based a sight on it. Some of the links didnt work, but other than that, I loved it. Hey your site is very good, clean, and simple. One thing you might want to look at is a way of separating the menu tabs more clearly. I would just like to start out by saying I think it’s so cool that you wrote a book! The colors also work out really well together. I wish there was an authors page so I could learn more about you guys! I thought it was pretty clear the site was for a book. I like the color scheme. I think the site corresponds well with the style of writing (based on the quote).